In QGIS, I am making maps of the same project in different scale (global and local). To make my symbol looks alike in all scales, I've choose to use proportional symbol with a size in "map unit". Therefore I have now a problem with the "Data-defined size legend" as my symbol are just way too enormous in the legend. How to get this right? Not the answer you're looking for? Browse other questions tagged qgis print-composer qgis-3 legend or ask your own question. Why are size-scaled symbols missing from map layout legend? Is there any way of making label size dependant from the value of an attribute? Changing symbol size using the “Size assistant” in QGIS? 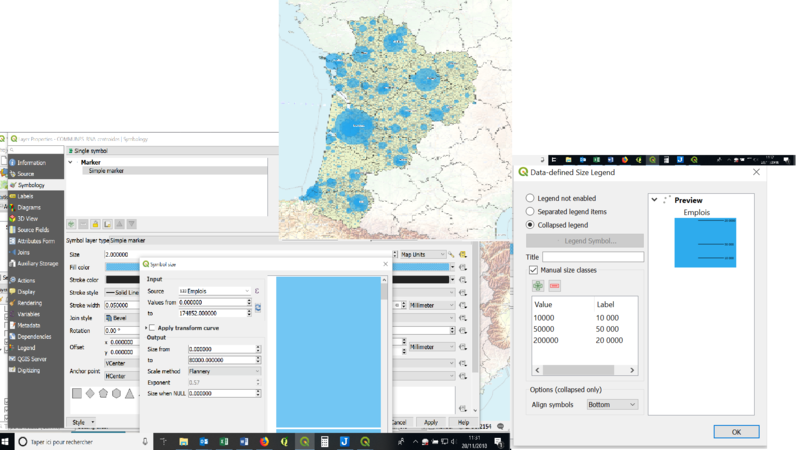 How to enable the map unit function in “Sphere_Miller_Cylindrical” CRS in QGIS? Display data-defined vector layer styling in the map legend?